With all of that, I set out to do a full review of an e-recumbent trike and that is how the TerraTrike Rambler with The E-BikeKit Electric Bike Conversion System came together! 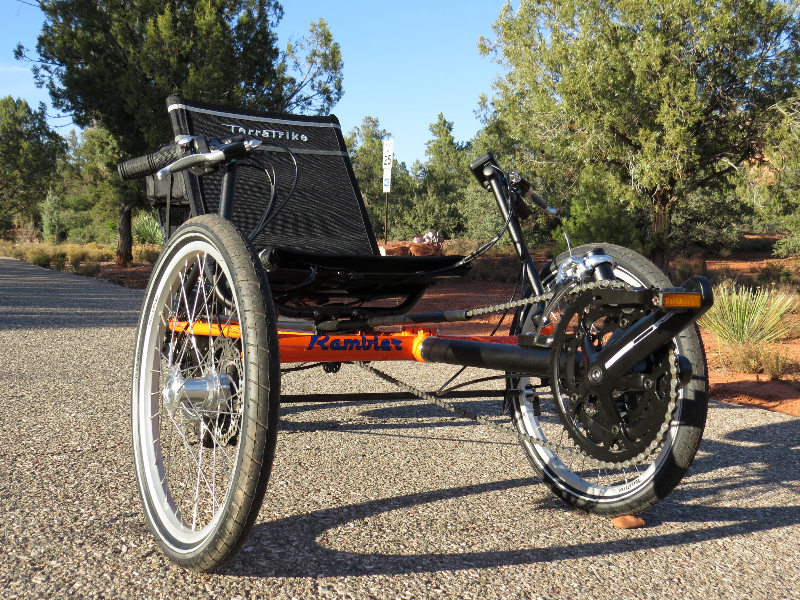 The TerraTrike Rambler is a mid level recumbent trike that has some nice features (chromoly frame, 24 speeds, disc brakes) and the new E-BikeKit system features a nice LCD display and provides an easy way to convert a bike or trike to electric. 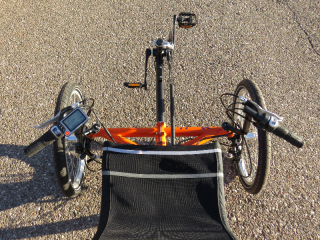 In addition, this particular E-BikeKit can power the trike up to 28 mph! The total price of the Rambler ($1,699 with Base component kit) and the E-BikeKit ($866) comes to $2,565, not including tax or shipping. The rear rack shown on this Rambler is an additional accessory that costs $59.95. 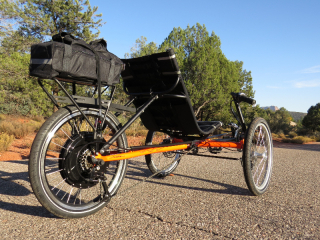 Make sure you check out part 1 of this review with a video, large detailed pictures and specifications of the TerraTrike Rambler with E-BikeKit to get familiar with this e-trike. In this second part of the full review of the TerraTrike Rambler with E-BikeKit, you will get an idea of the ride characteristics, range test, pros, cons, and overall thoughts on this e-trike. The TerraTrike Rambler is nice middle of the road quality trike with a 4130 chromoly main frame and aluminum boom tube. It also has an aluminum seat frame to keep the weight low. TerraTrike has 5 different trike models to choose from, including a tandem! TerraTrike offers a number of different component options for their trike models and the Rambler that I tested had their “Base” kit which is their mid level kit. They offer everything from economical to high end with their component kit options. The Base kit has a 24 speed drivetrain for climbing steep hills and for cruising along the flats. The cranks are FSA Tempo, the derailleurs and shifters are Microshift brand, the rear cogs (cassette) is SRAM, and the chain is KMC. This drivetrain package provides a wide range of gears with solid shifting. 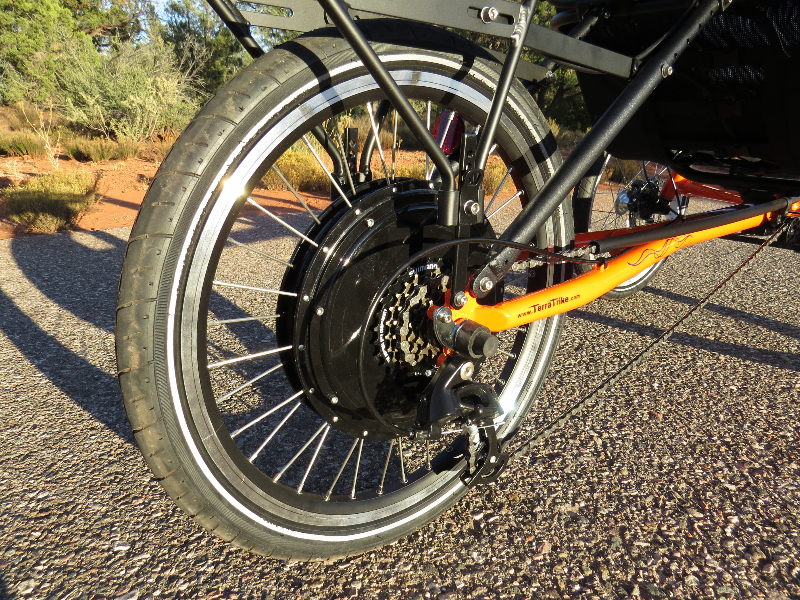 One change that was made to the drivetain was that the E-BikeKit comes with a 7 speed Shimano freewheel so that changed the overall drivetrain from 24 total gear options to 21. Braking on the Rambler is accomplished with the Alhonga mechanical disc brakes on both front wheels. There is no brake on the back wheel and this seems to be typical of most “tadpole” recumbent trikes (2 wheels in the front). One change that was made to the braking system was replacing the stock Promax brake levers with the E-BikeKit Tektro brake levers. The stock Promax brake levers have a locking button to keep the trike from rolling when it is parked. 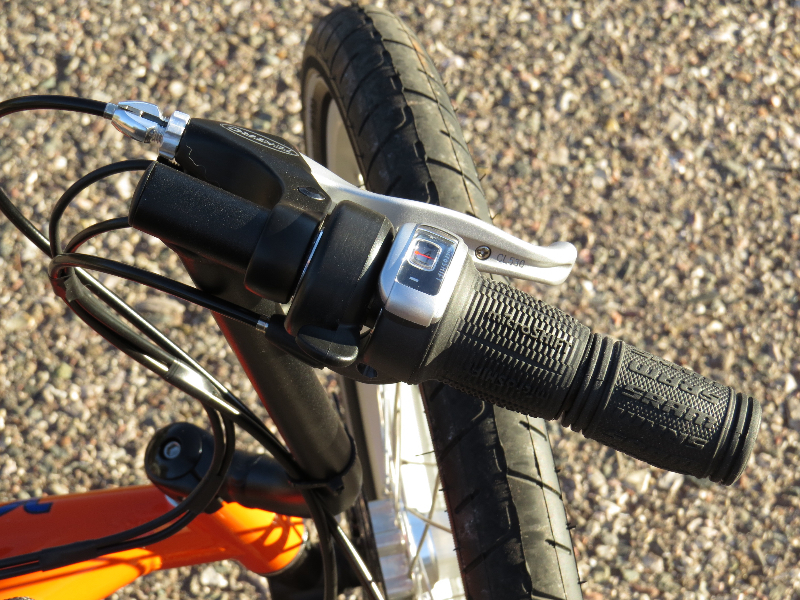 The Tektro brake levers from E-BikeKit do not have the locking button but they do come equipped with the electronic switches that will stop the electric assist when the brake levers are engaged. Since they do not have the locking mechanism I used a velcro strap to lock them out when needed. The wheel set on the Rambler is TerraTrike issue with single wall aluminum rims and aluminum hubs. The CST tires have a nice tread for riding the roads and a good reflective strip on the sidewalls for visibility at night. All right, now let’s talk about the electric specs! 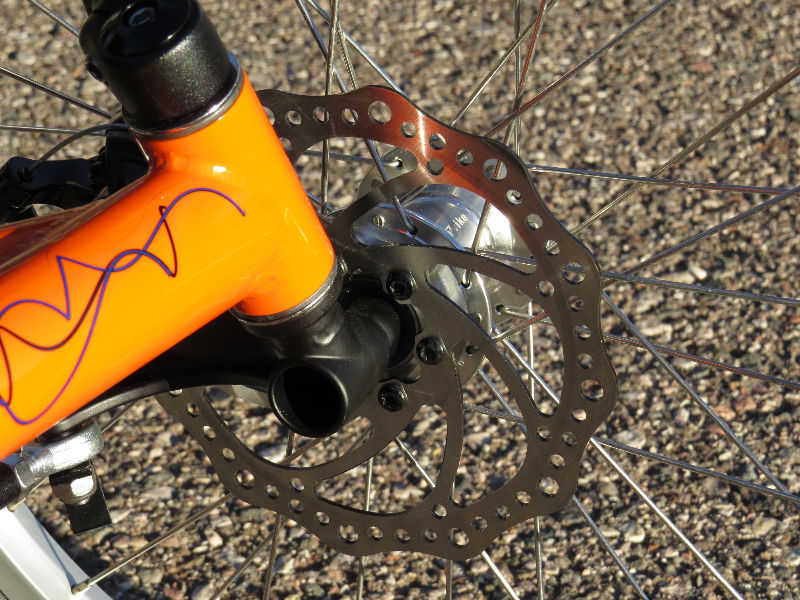 E-BikeKit sent a 500 watt (1,000 watt peak) direct drive rear hub motor laced up on a 20″ double walled rim with eyelets and 12g spokes. Their wheels are hand built by an expert wheel builder in Newportville, PA USA. E-BikeKit offers 20″, 24″, 26″, 29″ (700C) wheel sizes in all of their kits. E-BikeKit offers other motor types as well. They have a 500 watt front wheel direct drive motor as well as 350 watt geared front and rear hub motors. Disc brakes are definitely an option with the E-BikeKit motors because they have the typical 6 bolt attachment for disc brake rotors. Since the Rambler doesn’t have a rear brake it wasn’t applicable for this test. How about speed? Yes, this kit can fly! 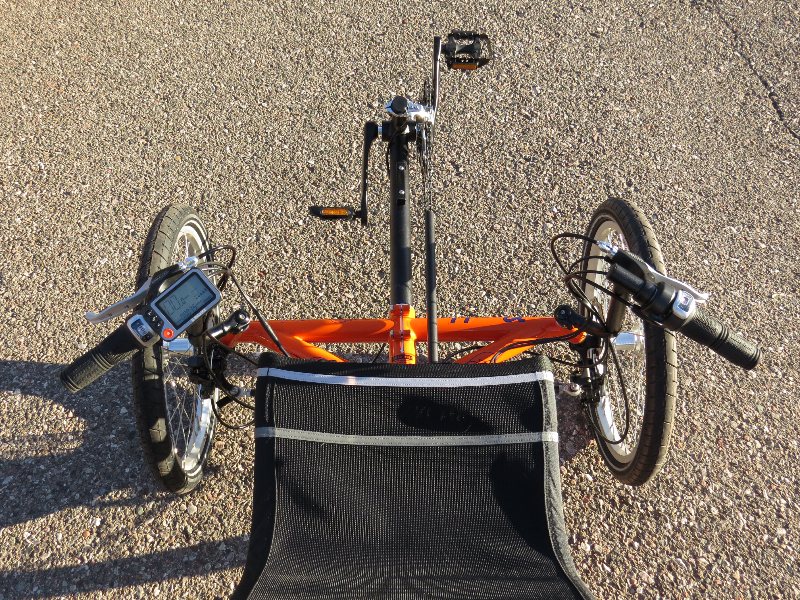 With the 48V 9ah lead acid battery that came with this E-BikeKit the trike could get up to 28mph…..throttle only. That is above the 20mph legal limit under the US e-bike rules so that speed needs to be used cautiously. In fact, after riding the trike at that speed for a while I would not recommend it to most people because at those speeds the steering is extremely responsive and you “need to be on your game”. More on that in a bit. The 48V 9ah lead acid battery takes about 3 hours to charge with the included charger. The stock kit comes with a canvas battery back that has velcro straps for attaching to a bike rack and there is an option to upgrade to a bag/rack system with more features. E-BikeKit offers other lead acid battery types as well as a selection of lithium ion batteries. The lithium ion batteries are lighter, smaller, and provide better overall performance; but they do add significant cost to the kit price. 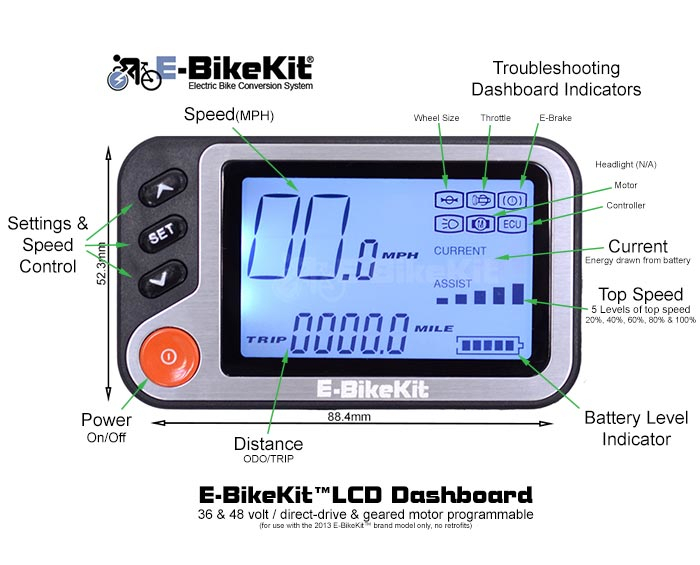 One of the new features for E-BikeKit systems is the LCD dashboard with information like speed, distance (trip and overall), battery level, speed level (there are 5), and the energy draw from the battery (current). The dashboard has a backlight for riding at night. It is very easy to see everything on the display at a glance because it is relatively large. An LCD display for a kit at this price level is a unique feature that sets it apart from other kits. Another unique feature is the 5 different speed levels that can be adjusted with the up or down arrows on the left side of the display. The assist levels are percentages of overall power and they basically set a limit on the max speed. 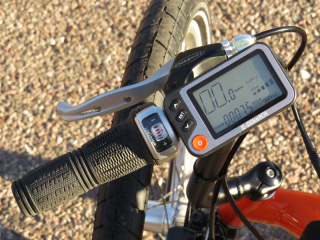 That max speed will vary depending on which E-BikeKit motor/battery combination is used. Below are the power levels and the max speeds for this particular kit setup. I found that it was nice to set speed levels for extending the range: lower speeds = more range. 2 types of throttles are included in every E-BikeKit: a twist grip throttle and a thumb throttle. It is nice that theses are included because you may want to try both or only one type will work with your bike. In this case, the Rambler has grip shifter so the thumb throttle was used. A 36v/48v 12FET controller comes with the kit and can be stored in the battery bag or attached elsewhere on your trike or bike. All of the connections of the E-BikeKit are very solid and have a definite “click together” feeling. There is a motor cable connector that makes the removal of the rear wheel relatively simple. You will need to still remove the torque arm and loosen the axle nuts to remove the rear wheel. The installation of the kit was very straight forward thanks to the thorough instructions. If you are not comfortable with the installation your local bike shop will be able to do the work with the instructions. My experience with riding recumbent electric trikes has been somewhat limited in comparison to the number of electric bikes that I have ridden. 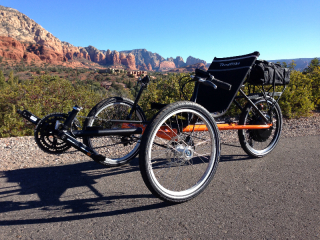 This summer I had a chance to ride the very high-performance Outrider USA recumbent electric trikes when the guys from Outrider USA paid a visit here in Sedona. Riding those high performance trikes certainly opened my eyes to what is possible with these three wheeled pedal/electric vehicles. Recumbent trikes and bikes are inherently low to the ground and as a result your visibility to cars, other bikes, and pedestrians is low. I highly recommend getting a flag and flashing front and rear lights for the trike, wearing high visibility clothing (yellow), and always be on the look out and ready to react to cars, bikes, and peds. Better to be over prepared! One of the first things you will notice about the Rambler is the comfortable ride thanks to the adjustable mesh seat. The seat can be adjusted forward and back and the angle can be adjusted between 40 and 65 degrees. Recumbents definitely feel pretty laid back. It’s kind of like you are pedaling from a recliner! Pedaling a recumbent on flat sections of road is fun and you can really cruise, but you don’t get quite the same leverage on the hills when compared to an upright bike. Of course, the electric assist helps with that. At lower speeds the Rambler does a good job with its turning radius. TerraTrike claims that it rivals traditional upright bikes. Okay, let’s talk about this high speed E-BikeKit. 28 mph is fun and exhilarating but it may be a little over the top. At that speed the steering of the trike is very sensitive so you really have to be focused on even the slightest movement of the handlebars. When pedaling the trike you have to focus on isolating your upper body from movement. I found that riding in speed levels 3 or 4 (15 mph or 20 mph) was the best for overall handling of the trike and it keeps the trike within the e-bike designation (20 mph max with throttle only). In addition, the range improves significantly at these lower speed settings. I would use the higher speed (up to 28 mph) to get through an intersection quickly or to keep up with traffic in congested areas. Since both brakes are on the front wheel, braking on a tadpole recumbent trike is a balance of equal pressure on both front wheel disc brakes. If you grab too much of one brake the trike will pull slightly that way. If you slam on the brakes there is a potential of the rear wheel coming off the ground, but you really have to hit the brakes hard! The width of the Ramble is 33″ so it can travel in most bike lanes and bike paths pretty well. On narrow roads you need to be aware of cars/trucks that may want to pass you. For this test I mounted the battery on the rear rack of the Rambler. The best location for handling would be behind the seat so that the weight of the battery would be low and centered. It looks like this would be possible but you need to make sure there is no interference with the chain. Here is the real world information on how the TerraTrike Rambler with E-BikeKit performed on my typical riding circuit that includes hills, flats, traffic, wind (when available) etc. While testing these bikes/trikes I like to put them through the toughest conditions to see where their bottom line is in regards to range and speed. Range: As you can see from the GPS info that I recorded, the TerraTrike Rambler with E-BikeKit traveled 9.4 miles and did a total elevation gain/loss of around 700 ft. Considering that this kit goes up to 28 mph, I weigh 190 lbs and I pedaled very lightly this is not great range for a 48 Volt 9 ah battery pack (432 Watt Hours) with a 500 watt motor, but then again this is with an inexpensive lead acid battery. A lithium battery pack would perform much better but it also costs considerably more. Watt hours are the total energy in a battery pack and it is based on the volts x amp hours of a pack. This is a way to compare the size of the “gas tank” of electric bikes/trikes. Please keep in mind that if you pedal more, weigh less than me, ride slower and/or you use the trike in terrain that is not as hilly you will get more range. These results are from tough testing. 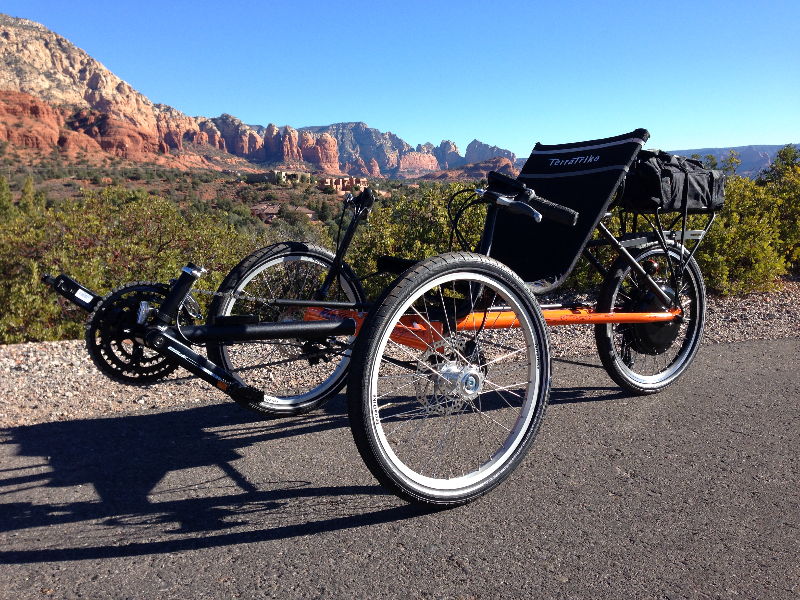 Speed: The TerraTrike Rambler with E-BikeKit can get up to around 28 mph on flat ground. It is a little slower than that on the climbs but it still goes pretty fast! Weight: This TerraTrike itself weighs 37 lbs. without kit. 76.6 lbs. with E-Bike Kit with direct drive hub motor and 48V 9ah lead acid battery. Total weight would be less with a geared hub motor and lithium battery. The lithium battery would increase the overall price. The weight distribution of the TerraTrike Rambler with E-BikeKit is pretty back heavy because of the rear hub motor and the battery pack being mounted on the rear rack. Mounting the battery pack near the seat would dramatically improve the overall weight distribution. Price: Considering everything that you get with this e-trike, the total price of $2,565 is pretty good. A chromoly frame, aluminum boom tube and seat frame, 21 speeds, disc brakes, 500 watt direct drive motor, and a LCD display round out some of the highlights. LCD Display: the LCD display from E-BikeKit is a nice feature for a kit in this price range. It is very easy to see the information and adjust the speed assist levels. The speed assist levels are also a unique feature and I found it very nice to have while riding this trike. Lead Acid Battery: Lead acid batteries are heavier, larger, and they don’t perform as well as lithium ion batteries. With that said, they are much more economical. If you can afford it, the lithium battery will offer a much better overall ride performance. Weight Distribution: In its stock configuration, the majority of the weight is on the back of the trike. It would be nice to have an easy way to mount the battery by the seat so that it is centered and low. Since the TerraTrike was not designed for this it is not really a con for the trike but just something to keep in mind. Overall the TerraTrike Rambler with The E-BikeKit Electric Bike Conversion System is a nice combination that creates a fun pedal/electric three wheeled vehicle! 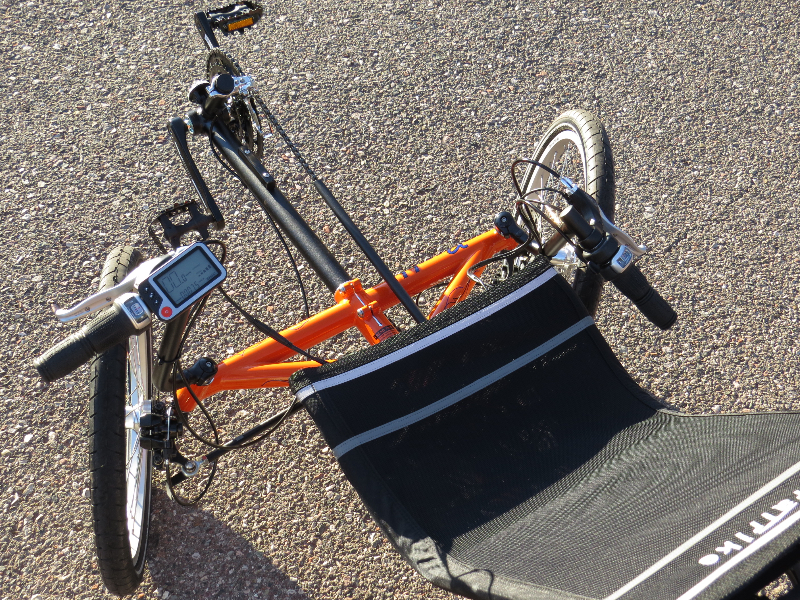 I believe that we will see more electric recumbent trikes in the future because they are fun and comfortable to ride. The combination of the Rambler with the E-BikeKit provides a quality e-trike at a reasonable price. The TerraTrike Rambler is priced at $1,699 and the E-Bike Kit 500 watt direct drive rear hub motor with 48V 9ah lead acid battery is priced at $866. The total price is $2,565, not including tax or shipping. The rear rack shown on this Rambler is an additional accessory that costs $59.95. Where to buy the TerraTrike Rambler? Check with TerraTrike for a dealer near you or you can order from them online. Where to but the E-BikeKit? Check with E-BikeKit for a dealer near you or you can order from them online. Do you have any questions about the TerraTrike Rambler with E-BikeKit? Do you own the TerraTrike Rambler or E-BikeKit or both? Please share your thoughts in the comment section below. I’ve been riding my Terratrike Rover for about three years. I converted it to an EBikeKit 500watt system during the initial assembly of the trike. I really do enjoy it but haven’t found it to be the ideal platform with two important considerations; 1) flexibility of the frame and 2) brake quality. The Rover is the bottom end, entry level frame for Terratrike and it continues to work as well as it ever did but I think some of the things you noticed in your review such as steering sensitivity at speed, torque steer when pedaling hard, or hitting bumps – and even cornering – are all exacerbated by the inherent flex of the box tube frame on the Rover. I would think that the Rambler would be better in these regards but haven’t tried one to know. 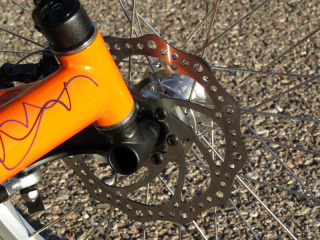 The brakes function adequately but are really the low end of disc brake systems. The pads are quite small and wear unevenly no matter how they are adjusted. Again, the Rambler has a different system and I would hope it is much better. Finally, I use the motor quite a bit and have only a single speed arrangement with a 52 tooth crank sprocket and a 14 tooth rear. I can pedal from a stop and it is very comfortable in the middle speed ranges. When I use the motor at its top speed (36 volt LiFePO4 = 20 mph), I don’t spin quite as fast as it does. Otherwise a large number of gears is pretty unnecessary for my particular use patterns. In all, I love this vehicle, but I’m designing and building a new system that will be even better come springtime. Anybody know about a conversion for a Greenspeed Anura? I could use some help getting up the hills. Jerry, you can use a front or rear drive motor on the Anura assuming you have the differential. Using the front wheel motor gives you the opportunity to retain your existing drive train & just use the power assist on the hills. It also moves your weight bias to the front where you will need it. I enjoy your report very much. 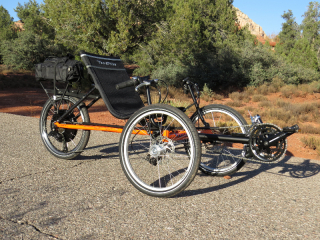 I would like to request an update on electric conversions of the higher end trikes, like Catrike and ICE. It’s been almost 3 years since this post and a lot is changing, in part thanks to success of the E-bike Expos. I love the Denver one this summer.